Endlessly ravenous or so it appears, they stalk you like the paparazzi after a film star, eager for anything you wish to discard especially if you’re eating hot chips (fries) on a sunny summer’s day. They are cute and annoying all at once but did you know they terrify the hell out of Yoda? Ah-huh, the very being who stands in awesome command of the Force, who can stare down a Sith Lord at 40 paces and drill the basics of being a Jedi Knight into one over-eager young farm boy from Tatooine by the name of Luke Skywalker, is scared of seagulls. Not irked, not mildly fearful, terrified, especially when they come for his knees (yes, all appearances to the contrary, he apparently has them). 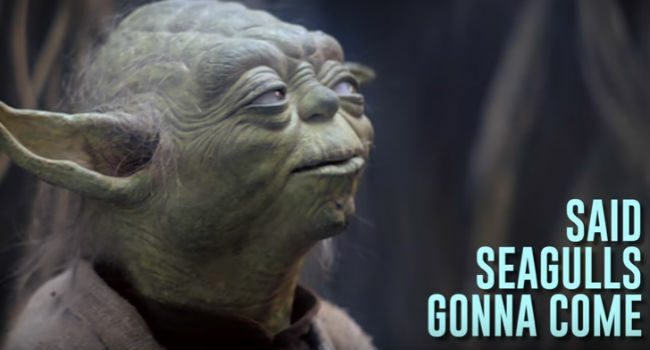 It’s all revealed in Bad Lip Reading‘s musical take of that iconic scene on Dagobah which is given a whole new revelatory, not to mention, damn near hilarious, spin.